Udupi, May 11, 2015: According to information to the media, Bishop of Udupi Catholic Diocese Most Rev. Dr. Gerald Isaac Lobo will inaugurate it and also celebrate the Holy Eucharist, at the inauration of the newly built Sacred Heart Church at Yermal-Uchila in Udupi district on May 14. From 1939, the parish priest of Shirva Church used to celebrate Mass at a house. Yermal was originally under the jurisdiction of Shirva for nearly 40 years. Later, six devotees donated land on which a chapel was built and it was inaugurated on April 25, 1961. 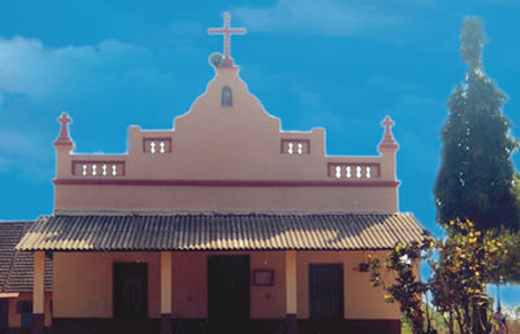 When Kalathur attained the status of a parish on June 7, 1971, Yermal came under its jurisdiction and was served from Kalathur. On May 25, 1993, Yermal became an independent parish and Fr. Peter Nazareth became the first parish priest. Fr. Henry Castelino and Fr. Vishal Lobo also served the community as parish priests. Fr. Lawrence Rodrigues has been serving as parish priest since 2009. There are 65 families in the parish with a total of 250 parishioners. The rear portion of the building was weak and the huge congregation for Mass caused a precarious problem. A new building was planned by the parish council. The parish priest Fr. Rodrigues worked out the project and with the help of parishioners, donors and well-wishers, completed it. The inauguration n on May 14 would be followed by felicitation function. Vinay Kumar Sorake, Urban Development Minister, Lalaji Mendon, former MLA, Abdul Hakim Musliyar of Sayyed Arabi Masjid, Uchila, and other dignitaries are expected to participate at this historic happening.